It's time for another outfit post. Yes, yes, I would love to babble on about fashion week, but given the fact that my battery lasts for about 1 hour and 13 minutes on my feet (whereafter I would have to pass out into deep sleep for at least 2 hours), running to fashion shows has turned out to be impossible. And I'm still somewhat swollen. Literally in my face. However I've had some good friends to help me out, so stay tuned for some awesome CPHFW action! I have a little funny notion on the (now very old) cropped H&M jacket. Back in high school someone complimented this jacket and asked me where I had gotten it. This someone was quite the fashionist and far more than I in school, so it was quite a surprise to receive that comment. Somehow the two letters H and M escaped my vocabulary, and were replaced with Paris. I got it on a trip to Paris! For one small moment I believed myself to have bought this chic jacket in a little Parisian store of an up-and-coming brand. I have never been to Paris. Not even France. That said, I hope you're all glad and well! Love the gorgeous contrasts of colours! Hope you're feeling better by the way love! the stripes are fantastic on you! wish you a fabulous weekend with lots of hot chocolate! Haha, nice jacket, funny that you almost even believed it yourself. Well, a girl can dream right. Hope you are feeling a bit better, curious to see some Copenhagen FW photos. hhahah love that story :) but it is a very chic jacket! lovely jacket and very cute story, hope you are feeling better at the moment ! 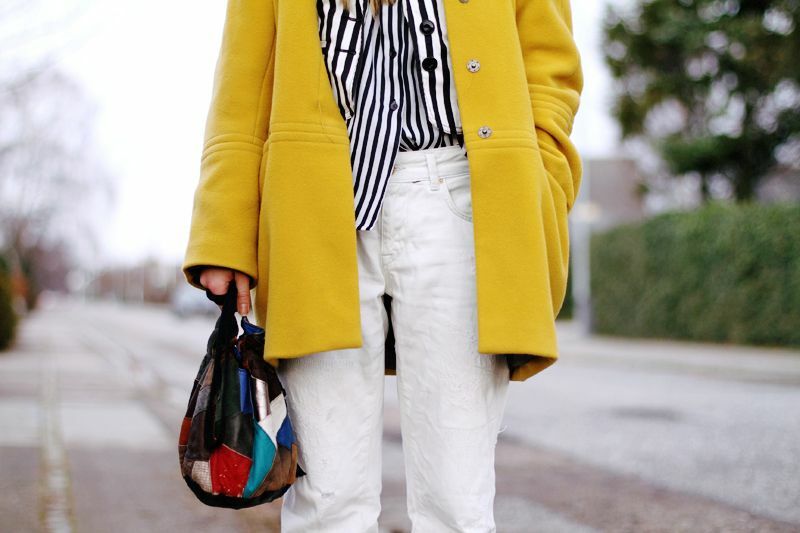 love the mustard coat with the striped shirt, looks lovely!